In the U.S., today is Veterans Day. Veterans Day began as Armistice Day, the day when World War I ended in 1918 (the eleventh hour of the eleventh day of the eleventh month). Early ceremonies honoring Armistice Day were observed in England and France. An English unknown soldier from World War I was buried in Westminster Abbey, and a French unknown soldier was buried at the Arc de Triomphe, each nation's highest place of honor. In the U.S., an American unknown soldier was buried at Arlington National Cemetery in 1921, and it became a special place of honor for American veterans. In 1947, a U.S. veteran from World War II organized "Veterans Day" in honor of all American veterans. In 1954, the U.S. Government officially changed Armistice Day to Veterans Day. Unknown soldiers from World War II, the Korean War, and the Viet Nam War were later added to Arlington. However, the body of the unknown soldier from Viet Nam was later exhumed and identified, and then moved. Today's Veterans Day ceremony will honor the tombs of the unknown soldiers, and parades will honor all U.S. veterans. In some other countries, November 11 is also remembered for veterans, and it is still particularly remembered for World War I. It is known as "Remembrance Day" in the U.K., Ireland, Australia and Canada. It is known as "Poppy Day" in South Africa and Malta. It is still called "Armistice Day" in Belgium, which was the first country deeply affected by World War I, and in France, where the Armistice Agreement ending World War I was signed. A 2004 article from Deutsche Welle reports the ceremonies and remembrances on November 11 in various parts of the world. There is no official ceremony in Germany, which lost World War I. "The Great War had been the worst disaster in history. Nine million soldiers were killed. Four empires had collapsed and large parts of France, Belgium and Russia lay devastated. The old order had been decimated and a new one was taking shape -- and this struggle would prove even bloodier than the war itself. "Millions of people - military and civilian - in every combatant nation had to cope with the war experience and its aftermath. Some people tried not to remember the war, while others built monuments to those who had died. Many went to the grave burdened by the unanswered question: 'What did it all mean?'" In the Catholic Church, today is also the memorial of St. Martin of Tours, patron saint of soldiers. On the occasion of the ninetieth anniversary of the battle of Verdun that you celebrate on this November 11, with His Excellency Bishop Leo Schwarz, auxiliary bishop emeritus, of Trier, who is presiding at Mass, I gladly join in the prayer of all people attending, beseeching from God the gift of peace and courage for an ever deeper harmony and fraternity between France and Germany. The Eucharist, by which we celebrate Christ’s victory over death, shows us that God is stronger than all the obscure powers of history, that love is stronger than hatred, and that, as St. Paul said, Christ, by His Cross, broke down the wall of enmity to reconcile men. (cf Ep 2, 14-17). We should give thanks for the path traveled since the great world wars which covered Europe with blood, making many victims. It has fallen to us today to act so that the sacrifice of men fallen on battlefields, for love for their country, should not be in vain. The remains of all the dead, without distinction of nationality, rest in the ossuary of Douaumont from now on, thanks to your predecessor Bishop Ginisty, who took the initiative to do so, having inscribed on the building’s frontispiece the word which summarizes all, “Pax”. In a memorandum of August 1, 1917, sent to the leaders of the warring peoples, my predecessor, Pope Benedict XV, proposed a lasting peace, and, at the same time, began a pressing call to cease what he called a "useless massacre". Verdun, a dark moment in the Continent’s history, must remain in people’s memory as an event never more to be forgotten, and never more to be relived, inviting the French and Germans, and more largely all Europeans, to turn to the future and to found their relations on fraternity, solidarity, and friendship among peoples. May our contemporaries, especially the younger generations, learn all the lessons of history and, in founding themselves on the Christian roots and values that greatly contributed to building the Europe of the nations, and the Europe of the people, endeavor to create bonds of fraternity and charity with each other, for the good of all and the development of nations, caring for the poorest and smallest. Verdun is also one of the symbols of reconciliation between two great European nations, formerly enemies, calling all countries that were at war with a move that gives people joy, because only reconciliation makes it possible to build the future and to consent to hope. Only reconciliation and reciprocal forgiveness can open the door to a true peace. Coming from a Christian spirit, they also serve as tests for political action. Such is today the responsibility of leaders, the people of Europe, and all nations. While entrusting you to the intercession of Our Lady, honored in all European nations as the patron saint of many churches, and of St. Martin, I grant to you, as well as to Bishop Schwarz, the priests, deacons, monks, nuns, the faithful who are present, and to all your diocesans, the apostolic Blessing. From the Vatican, October 21, 2006. Updated December 26, 2006: There is now an official translation of the foregoing letter on the Vatican website. Pictures: From my button collection and a memorial quilt that i have not finished making. 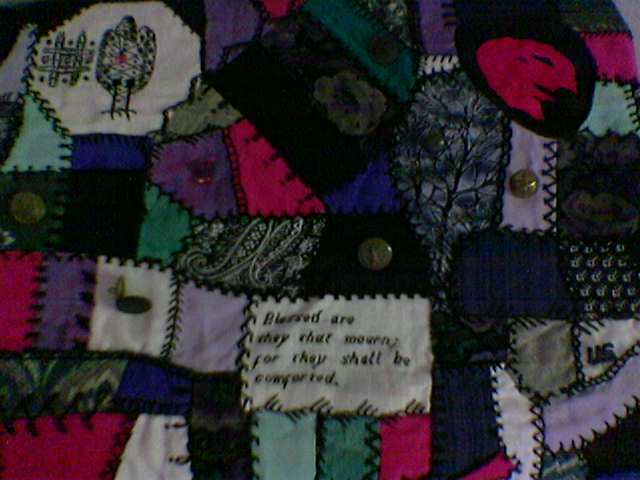 The stitchery includes American crazy quilt stitches. 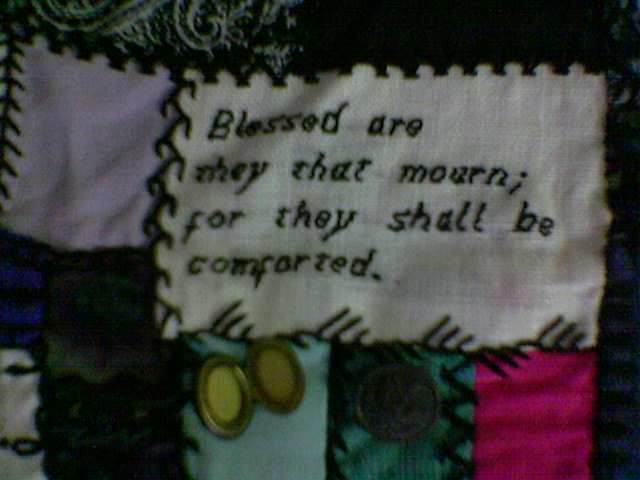 The needlework also includes a Spanish blackwork cross and pelican and italic lettering stitches. The fabrics include a pattern with tulips, which Dutch girls traditionally give to soldiers returning from battle. 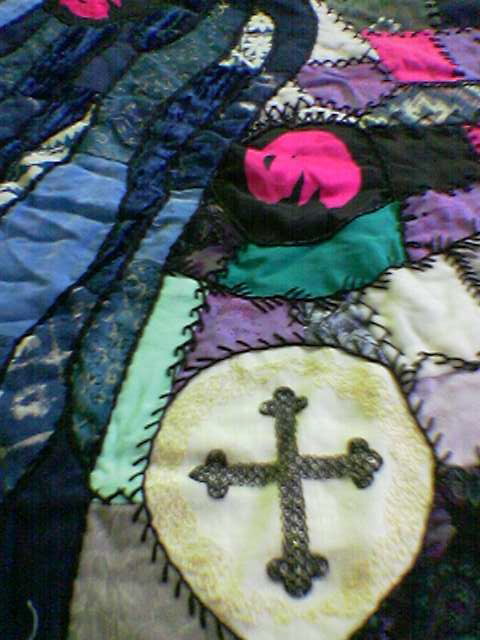 The blue fabrics along the left side represent the river from Psalm 46:4-5 ("There is a river whose streams make glad the city of God, the holy habitation of the Most High. God is in the midst of her, she shall not be moved.") The buttons are: (1) a U.S. World War I locket button (a rare collector's item, it looks like an ordinary World War I button from the front when sewn on a uniform, but it hides photos that allowed World War I soldiers to carry pictures of their family or sweetheart on their uniforms. The idea of the locket button followed on picture buttons from the U.S. Civil War era. In World War II, the technology was adapted to military purpose, and a compass was built into some World War II uniform buttons given to pilots and others with a risk of winding up stranded behind enemy lines.) (2) an ordinary U.S. World War I military button. (3) a New York State uniform button from the War of 1812 era. (4) a U.S. military button of a design made from 1840 to 1850 found at Fort Tejon in southern California. (5) a WAAC button (Women's Army Auxiliary Corps) from 1942 to 1943. (6) a French artillery officer's button made between 1863 and 1897 in Paris. (7) and (8) two plastic World War II troops support buttons (one is a "V" for victory with the Morse code dot dot dot dash for "V", drawn from the sound of Beethoven's Vth Symphony). The ecclesiastics moved the panels to the altar after a fire. the pictures work as a powerful inspiration to not abandon the Truth (see final virtue).